20 A None No Power Seat 20 A is a standard Premium Economy Class seat that may have restricted legroom due to the position of the bulkhead. 20 C None No Power Seat 20 C is a standard Premium Economy Class seat that may have restricted legroom due to the position of the bulkhead. 20 D None No Power Seat 20 D is a standard Premium Economy Class seat that may have restricted legroom due to the position of the bulkhead. 20 E None No Power Seat 20 E is a standard Premium Economy Class seat that may have restricted legroom due to the position of the bulkhead. 20 G None No Power Seat 20 G is a standard Premium Economy Class seat that may have restricted legroom due to the position of the bulkhead. 20 H None No Power Seat 20 H is a standard Premium Economy Class seat that may have restricted legroom due to the position of the bulkhead. 20 K None No Power Seat 20 K is a standard Premium Economy Class seat that may have restricted legroom due to the position of the bulkhead. 23 A None No Power Seat 23 A is a standard Economy Class seat that may have restricted legroom due to the position of the bulkhead. 23 C None No Power Seat 23 C is a standard Economy Class seat that may have restricted legroom due to the position of the bulkhead. 23 D None No Power Seat 23 D is a standard Economy Class seat that may have restricted legroom due to the position of the bulkhead. 23 E None No Power Seat 23 E is a standard Economy Class seat that may have restricted legroom due to the position of the bulkhead. 23 G None No Power Seat 23 G is a standard Economy Class seat that may have restricted legroom due to the position of the bulkhead. 23 H None No Power Seat 23 H is a standard Economy Class seat that may have restricted legroom due to the position of the bulkhead. 23 K None No Power Seat 23 K is a standard Economy Class seat that may have restricted legroom due to the position of the bulkhead. 27 C None No Power Seat 27 C is a standard Economy Class seat however, the close proximity to the lavatories may be bothersome. 27 D None No Power Seat 27 D is a standard Economy Class seat however, the close proximity to the lavatories may be bothersome. 27 E None No Power Seat 27 E is a standard Economy Class seat however, the close proximity to the lavatories may be bothersome. 27 F None No Power Seat 27 F is a standard Economy Class seat however, the close proximity to the lavatories may be bothersome. 27 G None No Power Seat 27 G is a standard Economy Class seat however, the close proximity to the lavatories may be bothersome. 27 H None No Power Seat 27 H is a standard Economy Class seat however, the close proximity to the lavatories may be bothersome. 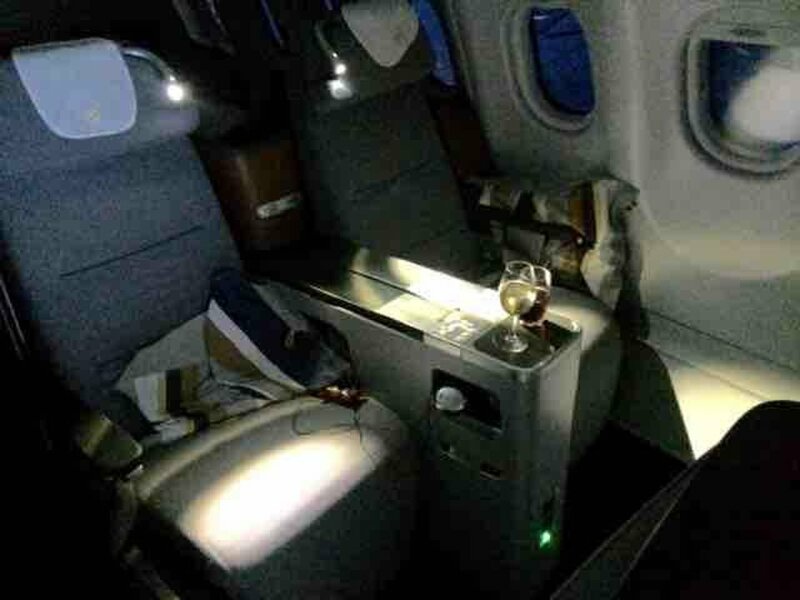 This aircraft is operated in a four class configuration with 8 First Class suites, 30 flat bed Business Class seats, 21 Premium Economy seats, and 177 standard Economy seats. Flew MUN-DEN on this seat with my spouse. 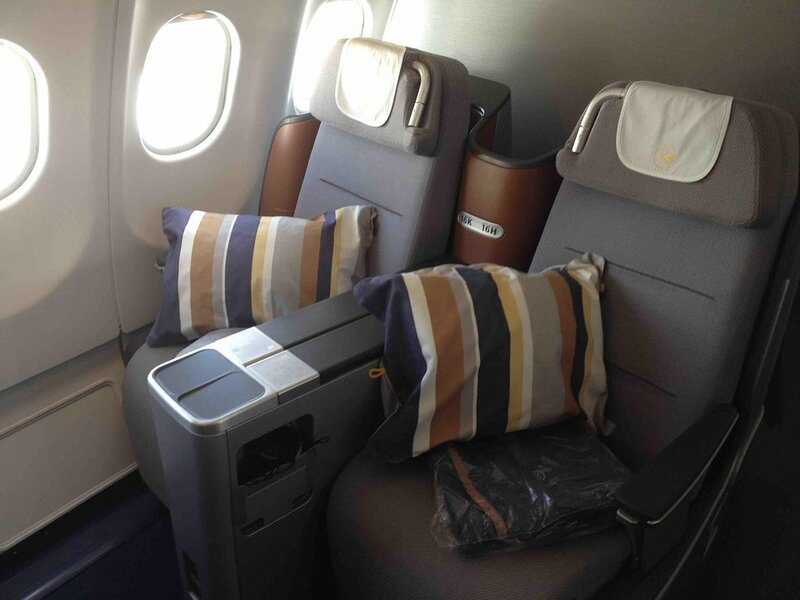 We had chosen those seats because we knew we were able to recline fully even though they are in the last row. Some people do not enjoy being close to the galley because of the noise, I can tell you that when on a day flight, it's very convenient as you can get up and pick drinks easily. The seats were ok but only when travelling as a couple because the seats are rather narrow and do not offer much elbow rest. IFE ok with a large selection of classics, don't expect the lastest blockbusters. Really going to miss these aircraft when they're inevitably phased out. The 2 seats instead of 3 are really nice bc you don't have to climb over 2 people to get out of the window seat. The seats themselves are pretty comfortable with decent padding for economy. What makes this forward part of the aircraft especially nice for me is the quietness; even during takeoff i could still talk to my mother in the seat next to me, and at cruise it sounds more like a loud bus than an aircraft. You do sacrifice a bit of view because this seat is over the rear part of the wing, but you dont lose all of it. Lufthansa food & service great as always. Legroom in economy is disgracefully small for an 11 hours flight! Quality of the seats is terrible, very limited padding - seems like being sitting on a wooden bench for 11 hours! As noted the leg in front of this seat is in an awkward place which makes it difficult to stretch one's legs. Since the aisle is a bit wider I was able to stretch my legs out in the aisle. The cargo net at the bottom of the seat back was not fully attached so there was no place to stow any personal items. Restrooms are a long walk from this seat. Would not recommend any of these seats in the far back of the plane. This is a terrible seat. The legs and life vest compartment for Row 40 sit squarely in front of this seat. Occupant must straddle this. And the entertainment console is off-center as well. I was pleasantly surprised. Nice seat, with decent recline for economy. Everything is brand new. Great entertainment selection, impeccable service. I was surprised by full bar twice, plus the digestive after the meal service. Every half an hour or so FA's pass through the cabin with water or soft drinks. I haven't seen that in a while. All and all, the decent seat, entertainment and amazing service (and that's economy, I've flown Lufthansa First Class before) made a 10.5 hour flight very enjoyable. This seat has the advantage of aisle access without anyone crossing over the seat. It is not angled too much, so there's no "playing footsie" as with some of the other LH layouts. The neighboring seat was close enough for conversation, but separated enough that it felt private when done talking. The large screen is very nice, and the adjustable inflation of the seat welcome. I was surprised at how uncomfortable this seat was when extended into a bed. Alfhough the cabin staff lay down a full-length mattress cover, it is very thin, and doesn't eliminate the ridge that crosses the bed half way down and dug into the small of the back. I laid the quilt over the pad to give me more protection and that proved to be better but as a sleeping platform this Lufthansa First Class bed is nowhere near as good as the United equivalent. The service was friendly and the food more than adequate but I'm very glad i flew on points rather than paying for this flight. horrible seating in economy class: 1. not only the seats are spaced very close, they recline quite a bit. If somebody in front of you reclines you have no choice but to recline because otherwise the entertainment device screen is 6 inches before your eyes. 2. the armrests do not fold. with a seat reclined in front of you it is close to impossible to vacate your seat. 3. each seat mounted screen has a computer to power it. 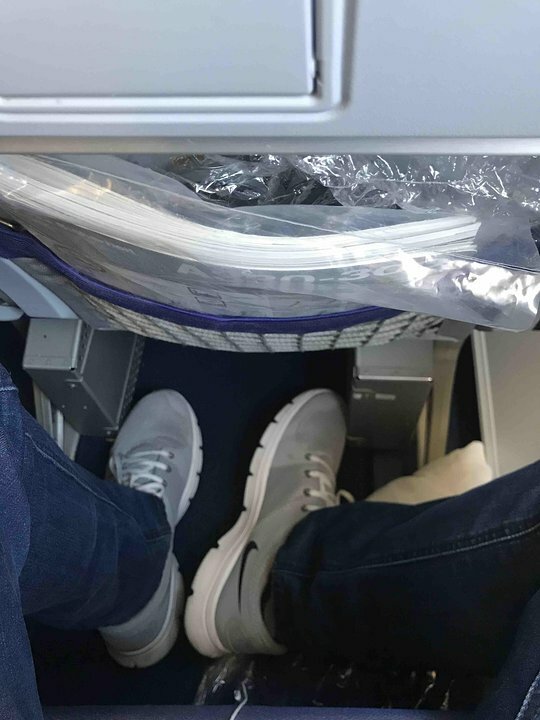 the computer in form of bulky steel box is installed in your leg space, reducing by 40% amount of you leg room. All in all this aircraft is horrible and I will make sure I will never travel on it in the future. Excellent seat - heaps of legroom - should be marked green. No bulkhead in front that is disturbing just a little partition behind Premium economy. Even a bigger screen in front on top of the folded screen in the armrest. 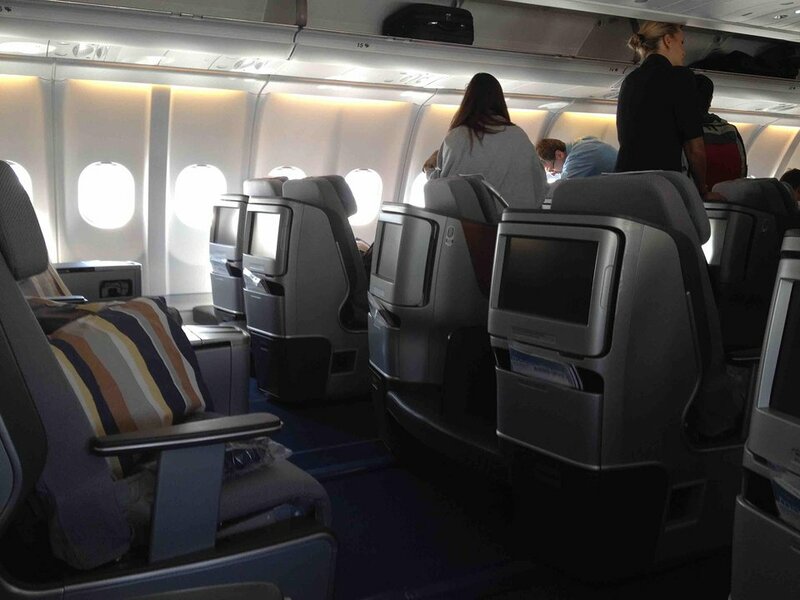 The video screen is located in the armrest, so it has to be stowed during takeoff, climb, and descent. First time in LH Business, thought the food was good, service on par with what I've heard about LH. Glad to have the new seat, good for traveling as couples. They are a little narrow and not the most comfortable if you are broad. It can also get a bit warm in the cabin but that seems to be common for all LH flights. Good value on miles, wouldn't pay cash for this.